Happy hump day! Thank god the week is halfway over! Tomorrow is the Anthropologie fashion show down at Lenox Mall and I’m stoked! Then I work from home all next week since my little people have spring break, YAY! Let’s hope the remainder of this week goes by fast so I can bust outta here! I’m not going to give you a ton pretty pictures and it’s kind of a vent. Well, just facts really so feel free to comment with your Stitch Fix thoughts. I know most of you love your stitch fix subscriptions and that’s cool. I gave it a shot for about 6 months and finally I have decided cancel my Stitch Fix! Being a fashion/style blogger my main goal is to “share” my style with my readers in hopes of giving them inspiration. I know myself as a reader of many other style blogs, I look to bloggers for style inspiration or products referrals. If they have a piece that I love or a product they swear by most likely I want to purchase the same item. While my stylist eventually sent me items that I did like, most I could not find anywhere online. The only time I ever found a brand was when I received a pair of Steve Madden mules. Other than that, each month I would receive my box and search high and low for the item without luck. I sometimes would even search for the brand and still nothing. The only thing I would turn up would be other bloggers reviewing the same items they got in their fix. But no place for anyone to purchase online. This also has nothing to do with not being able to use affiliate links. Take those out of the equation completely. Here’s an example. 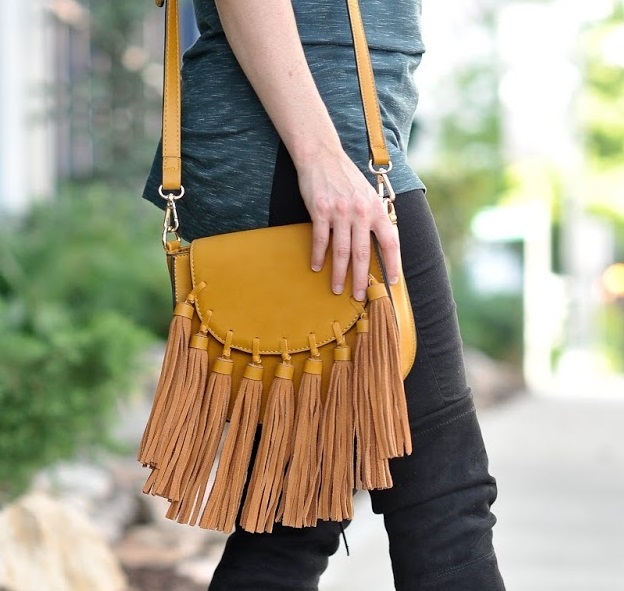 Remember THIS POST I showed you with the cutest mustard colored fringe bag? It was a dupe of the Chloe Hudson Bag. I wanted to purchase a second one for my friend since she loved it so much but it was NOWHERE to be found online. I mean from what I can see they don’t even seem to be items from the prior season or year. There is just literally no trace of them online ….unless like i said you request a pair of shoes ……usually you get something like lucky brand or Steve Madden. Two months ago they sent me the most fabulous layered gold choker known to man. I wanted to share it online. But seriously why get my readers hopes up that they can but it? The brand was literally non-existent online and I couldn’t find anything similar at all. Very disappointing. On top of that I felt like I was throwing away money every month because I rarely kept anything! Now I still love the concept of monthly subscription boxes especially when it comes to clothing which is why I am going to try out Trunk Club! What I love is that they are part of my favorite department store Nordstrom and they get all of their items there so I’m positive you will be able to find the items online. Have any of you ladies tried Trunk Club? What are your thoughts? Previous Tory Burch Private Sale – Up to 70% OFF! Next Pom-Poms are Back for 2017! Aw, this was an exceptionally nice post. Taking the time and actual effort to make a superb article… but what can I say… I hesitate a lot and don’t manage to get nearly anything done.